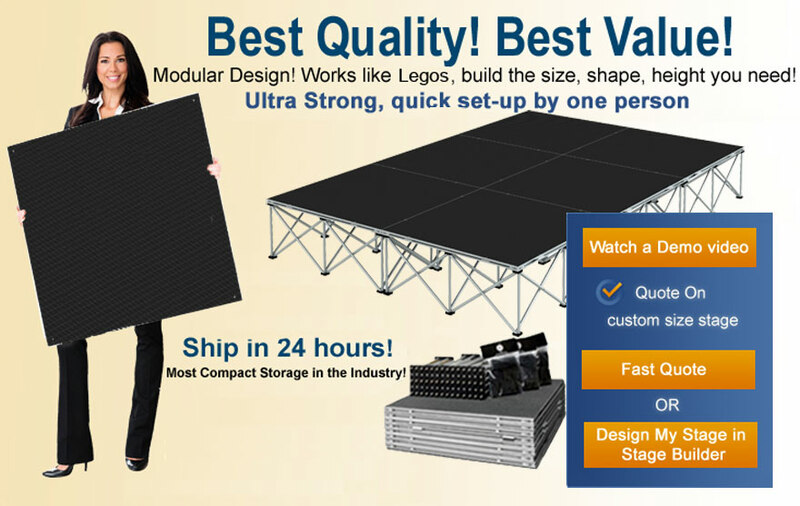 The best value on the market today, Our portable stages are the most customizable, portable and compact in the world! These kits are ready to roll and include everything you need to get your show going including platforms, risers, and all the necessary hardware for putting your stage together. Available in several heights. We have a kit to fit your needs and your budget! And because our staging is modular and works similar to Lego building blocks, if you ever need to make your stage bigger, don't worry, we sell our Stage Platforms and Stage risers individually so you can upgrade your stage size, shape or height for future needs. Our staging is also super strong and supports 157lbs per square foot. It can even support a car! Check out this video of a car being driven onto one of our stages Car Video. Optional accessories such as Stage skirts, Stage Guard Rails, Stage Back-Drops, Stage Ramps, and Transportation cases and Trolleys are also available. If you don't see a kit that fits your needs, just give us a call and we will be happy to customize one that fits your needs or use our online STAGE BUILDER (Click Here) for an instant quote. Lightweight, accordion style modular staging system. Platforms come in 4ft x 4ft and 3ft x 3 ft sizes. Square, quater round and triangle shaped platforms are available. Can be set at various height: 8", 16", 24", 32"
Available in gray carpet, black carpet, industrial finish and tuff coat finish. Most compact storage. Stores in (4' x 4') foot point. Fast, easy set-up by 1 or 2 people. Perfect for schools, churches, hotels, exhibition halls and many other applications. Steps, ramps, guardrails, backdrops, storage trunks and transportation trolleys.